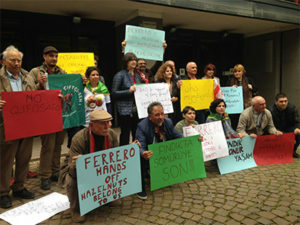 On April 17, 2018, celebrating the International Day of peasant struggles, Schola Campesina facilitated an International conference on the hazelnut supply chain bringing together, in Nepi, (Italy) hazelnut producer family farmers and their organizations from Georgia, Italy and Turkey. Beforehand, the participants visited Italian farms, shared experiences on production, markets and contract farming and took advantage of being together to commit in the construction of an international solidarity network amongst them. Turkish Farmer Unions Çiftçi Sen / Fındık-SEN, the Georgian Biological Farming Association Elkana and the Biodistrict della Via Amerina e delle Forre jointly signed a Final Declaration.